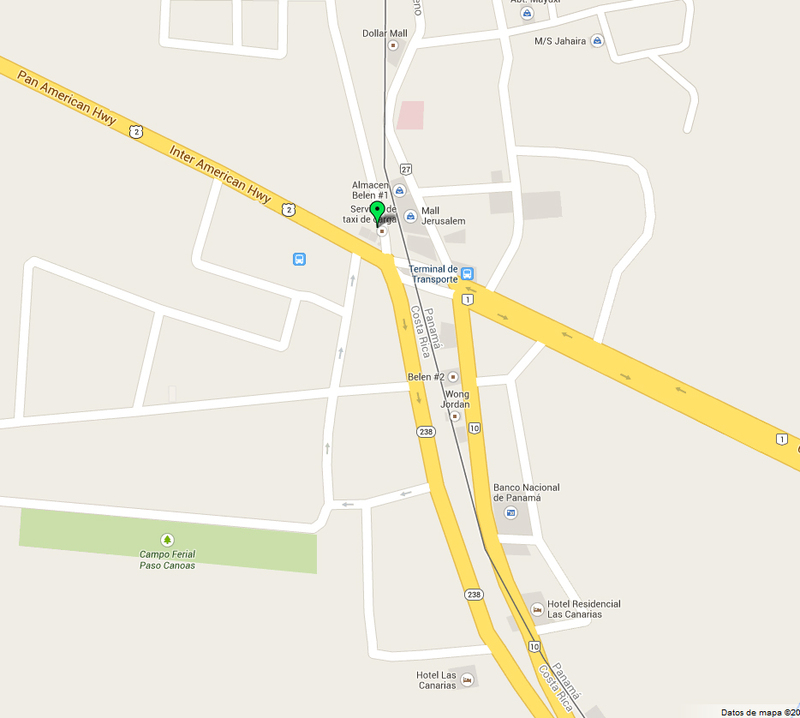 On Friday, May 9, we decided to drive to Paso Canoas, Panama, the nearest border crossing from where we live in Costa Rica. It’s about a 2 hour and 15 minute drive southeast, which is manageable in one day. We wanted to go there to check out the shopping. We have heard that the cost of imported goods are much less expensive in Panama than in Costa Rica and we decided to find out if this was true or not. 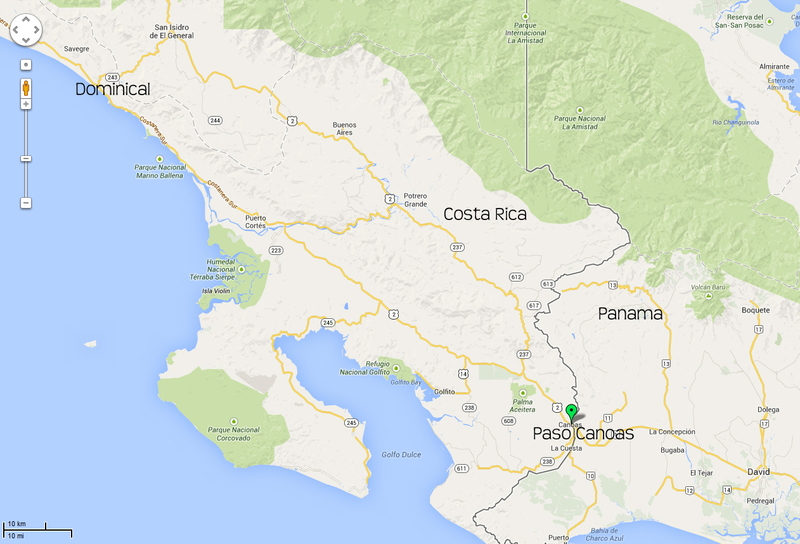 Paso Canoas border is interesting…literally one side of the street is in Costa Rica and the other side is in Panama. 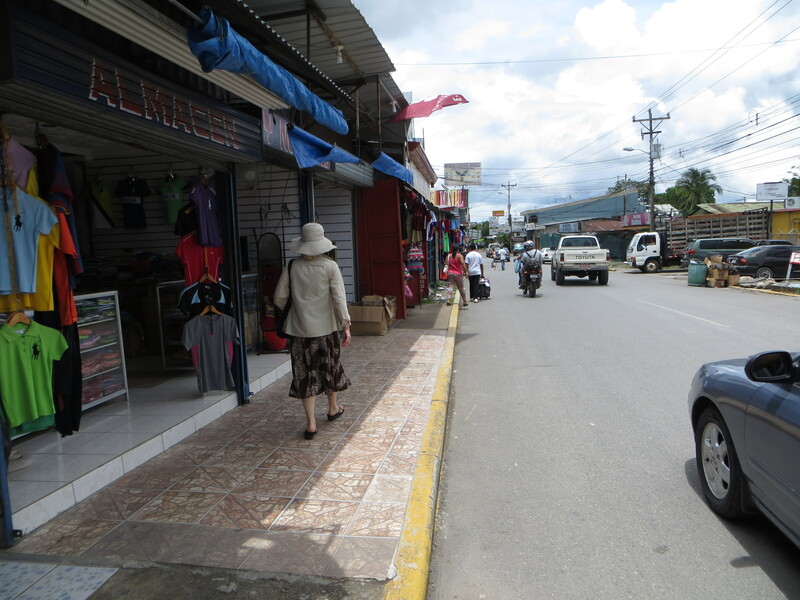 So, we found a parking lot (with an attendant) on the Costa Rican side and walked across the street to Panama to shop without going through immigration and customs. At times, we weren’t sure in which country we were walking! 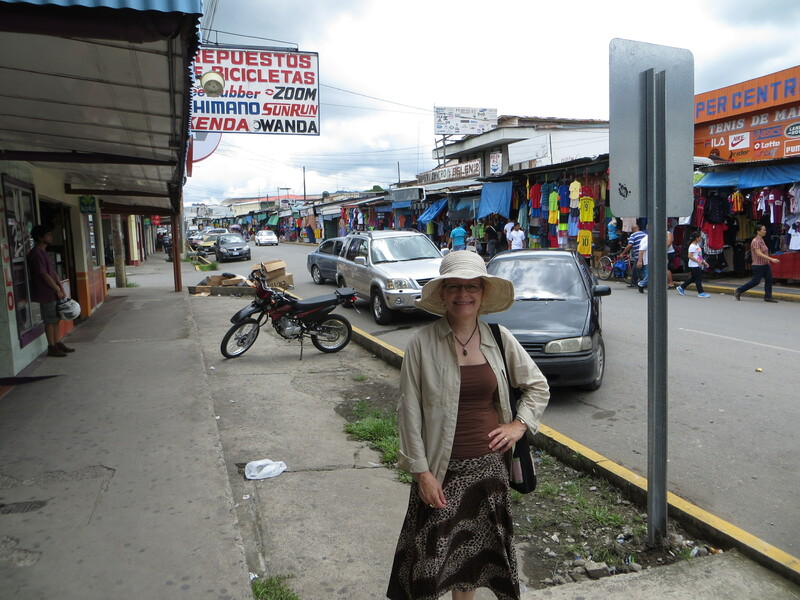 In the stores, it was easier; on the Panama side everything was priced in U.S. dollars and on the Costa Rican side everything was priced in Colones, CR’s currency. It was fun looking around in the shops to see what was available, but we were mostly interested in the grocery and liquor stores. Border street in Paso Canoas. Ellen is standing on the Costa Rica side. We stopped in two grocery stores and at the first one we found Provolone and Swiss cheese. We have found Swiss cheese in Costa Rica, but not only is it expensive, it’s not very good. So far, we haven’t found Provolone in CR. We also bought an umbrella, which came in handy a little later in the day. The second grocery store, we found more items that we haven’t found in CR. A few things that we bought are: Domino light brown sugar, white quinoa, hummus, hamburger pickles, light Miracle Whip, pickled jalapenos, sour cream, and Philadelphia cream cheese. The prices were a little higher than those in the U.S., but we were glad to find some things we had been looking for. When we left the second grocery, it was pouring down rain and we had to walk quite a distance to the truck. Fortunately, I had the umbrella and it helped a little bit as it was a little breezy. We were both quite wet when we got to the parking lot. Where we really saved some money was at the liquor store. Beer, wine and booze in general are all very expensive in Costa Rica. The liquor prices in Panama are much less than in the U.S. or at the Duty Free stores in Costa Rica. We only stopped in one store because of the rain. There we bought some wine, rum, cognac and a very nice French champagne (for our 34th wedding anniversary next month). The more we bought, the better the prices. Next time, we will bring a shopping list so we can negotiate up front. Just in case we were stopped at one of the two Costa Rican checkpoints, I put the cognac and champagne on the floor of the front seat behind my legs and covered them with my skirt. (Recently, we met a couple who had all of their liquor confiscated.) We were stopped at the second checkpoint, but the policeman only peeked into the truck through the windows. Our big white cooler was in the back seat area. He didn’t even ask for our passports. But, he did ask us where we were going. When we told him, he let us pass. When we arrived back to the house, I opened the truck door to hop out to open the gate and out dropped the champagne onto the concrete! It started rolling down the steep hill, but I managed to catch it before it rolled too far. Amazingly, the bottle didn’t break…not even a crack…thank goodness! More adventures to come!.What a fun day you had! You’re right about that…it’s always an adventure here! What a great save Ellen! Sounds like the trip was fun – and manageable – distance wise! The photos are interesting! Thanks for sharing! I was so lucky…I’m sure it would be very bad luck to break a good bottle of champagne!